So I’m going to work backwards with my sharing, because I’m just so thrilled with what Chantal & I made today (she only left about an hour ago!). 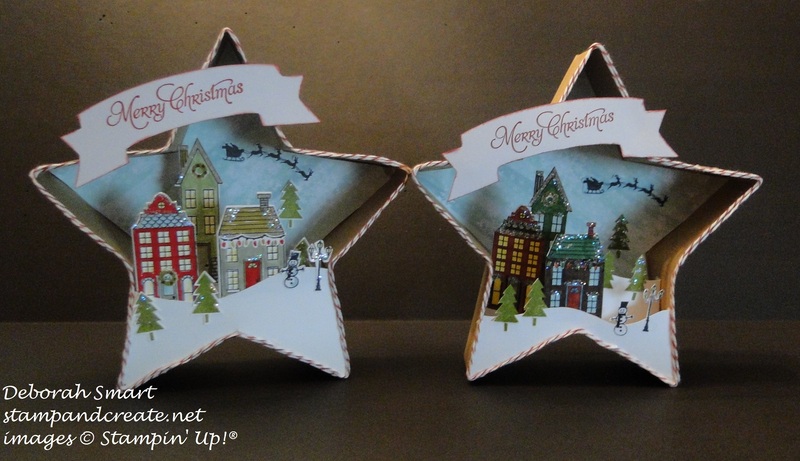 Chantal had purchased the Many Merry Stars Kit – currently in the Clearance Rack at the amazing price of only $25.59 – and she asked me if I wanted to get together to make a 3D project that she had seen on Pinterest. Here’s what the Many Merry Stars Kit looks like – it’s amazing! You get all of these supplies, enough to make 25 3D stars of various shapes, plus tons of fabulous embellishments & die cuts for decorating them! We pulled out our White Christmas and Holiday Home stamp sets (the White Christmas set has carried over, and is in the current catalogue on page 68), and the Homemade Holiday Framelits set (which is also in the Clearance Rack, for only $16.19! ), and got to work. First we traced the outline of the star onto a piece of retired All is Calm DSP, to use that as a background inside the star. Then we stamped the images we wanted to use; houses, trees, snowman, Santa & sleigh, wreaths and lamppost, and coloured them in using our Stampin’ Write Markers. We used the Homemade Holiday Frameltis to die cut the houses using the Big Shot; the rest of the images we cut by hand using our Paper Snips. Chantal had brought some really pretty, fine glitter, so we added some of that to our cut-outs – just the perfect amount, I think! Then we assembled our stars; we were creating a diorama, so we only added the sides, not the top/lid. After adding the sides, we insert the DSP background, then cut some Whisper White cardstock for our ‘snow’, and attached that to the inside. Then we added all our cut-out shapes, creating a little ‘town’ scene! We finished off the outside of the star by adding a double layer of Cherry Cobbler Baker’s Twine (that was one of the recent Weekly Deals!) all around the edges. Using one of the die-cut banners included in the Kit, we stamped the Merry Christmas , and added it across the top. Here are our final star dioramas! Didn’t I tell you they were too cute?!! Mine is on the left; Chantal’s is on the right. They’re basically the same – I mean, we used all the same stamp sets & products, but we chose some different colours, and our ‘snow’ fronts are a bit different. I love them both!! Of course, as we were looking at these two, our imaginations were kicking into high gear; just imagine the grand scene you could create, using more stars, and of different sizes – you could create a whole town, and add more house, more trees & wildlife (the White Christmas set has a Polar Bear and a Deer! )….the possibilities are endless! You could also use the new Every Blessing stamp set for a scene with the Wise Men! I hope you enjoyed seeing what we created today, and are inspired to get creating too! I’ve listed the available products that we used below; if you’d like to order them, you can click on the image(s), and you’ll be taken directly to my online store. 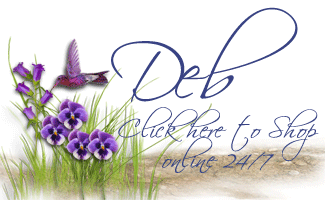 If you’d like me to place the order for you, just send me an email or call me at 604.298.0472, debsmart@shaw.ca I’ll be happy to take care of that for you! I’ll be back tomorrow to share pictures from my Christmas in July stamp a stack! Next Next post: Paper Pumpkin Special & Weekly Deals! So cute! I am going to CASE your idea and stamp with my sister when she comes to visit in early August. Thanks for sharing this…it’s a great idea! I’m so glad you like this project, Maggie! What a great way to spend some time with your sister :). Have fun – I’d love to see your projects, if you’ll send me a picture, I’ll shae it on here!